The Final Fantasy Legend, known in Japan as Makai Toushi Sa·Ga (魔界塔士 Sa・Ga, Warrior in the Tower of the Spirit World ~ Sa·Ga), is a video game released for the Game Boy in December 1989 by Square Co. It is the first game in the SaGa series and the first computer role-playing game for the system. 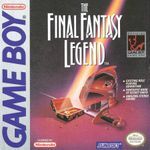 Square translated the game into English in 1990 for worldwide release and renamed it, linking it with the Final Fantasy series to improve marketing. Sunsoft re-released it in North America during 1998; Square followed with an enhanced remake released for the Wonderswan Color and mobile phones in 2002 and 2007 respectively. In Final Fantasy Legend, the player navigates a character throughout the game world with a party of up to four characters, exploring areas and interacting with non-player characters. Most of the game occurs in towns, castles, caves, and similar areas. To aid exploration on the field screen, Final Fantasy Legend makes use of various signs within towns. The player is initially limited to the World of Continent to explore, and given access to later worlds as his or her party climbs the Tower. Players can save their game anytime and anywhere when not in combat to a save slot for later play. Players can journey between field screen locations via the world map, a downsized representation of Final Fantasy Legend's various worlds. Players can freely navigate around the world map screen unless restricted by terrain, such as water or mountains. The goal in each world is to find the entrance to the next level of the Tower. Random enemy encounters occasionally interrupt travel across the world map screen and hostile areas, as in other Final Fantasy related games.